CHT-THEMIS is the controller block of the Power Transistor Driver solution CHTTHEMIS and CHT-ATLAS. 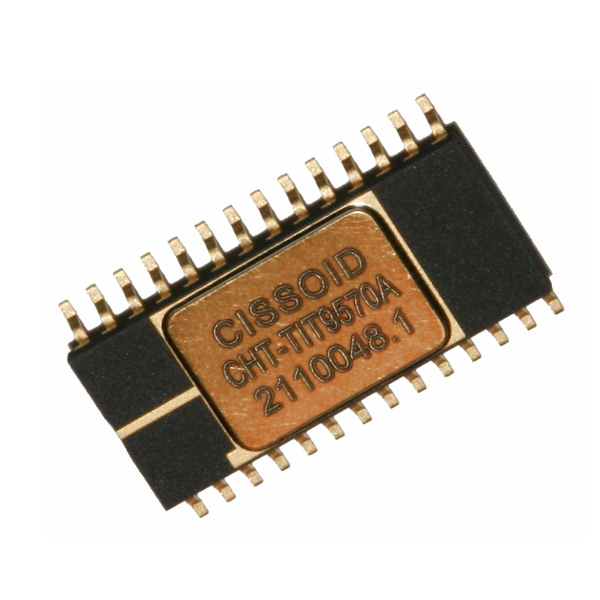 The chipset is specifically designed to drive wide-bandgap power transistors, in particular Gallium Nitride (GaN) and Silicon Carbide (SiC) devices including normally-On and normallyOff JFETs, MOSFETs and BJTs. It is also used with standard silicon MOSFETs and IGBTs in standard temperature applications (e.g. 125°C) where it brings an increase in reliability and lifetime by an order of magnitude compared to traditional solutions. CHT-THEMIS can drive up to 5 CHTATLAS chips for very high power applications that require up to ±20A to the gate of the power device. It implements a state machine that manages the control and the fault signals, it embeds a voltage reference as well as a 5V linear voltage regulator which is used to supply CHT-ATLAS. This 5V power supply can also be used to power up other external circuits, such as the isolated transceiver CHT-RHEA for complete isolated gate-drive implementations. The circuit features an adjustable under-voltage lockout (UVLO) function with hysteresis as well as a de-saturation detection circuit. It also includes a pulse generation pre-driver to accommodate for Normally Off SiC JFET. CHT-THEMIS also features an active Miller clamping (AMC) function and predriver for an external transistor.